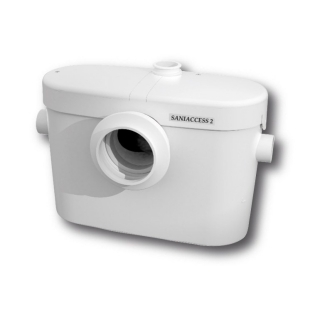 Saniaccess 2 is a macerator designed for use with a single WC and washbasin. It is suitable for light commercial ( guest houses, offices etc) as well as domestic installations. Saniaccess is unique in so far as it has two seperate chambers, one for the motor and one for the pressure switch. It is designed for easy access should any maintenance be required. In most instances the unit does not need to be disconnected from the toilet.